This article is about the David Bowie song. For the trousers, see jeans. For the bird, see Blue-grey tanager. For the supercomputer architecture, see Blue Gene. "Blue Jean" is a song written and recorded by David Bowie for his sixteenth studio album Tonight. One of only two tracks on the album to be written entirely by Bowie, it was released as a single ahead of the album and charted within the Top 10 in the UK and the United States, peaking at No. 6 and No. 8, respectively. The song is loosely inspired by Eddie Cochran. 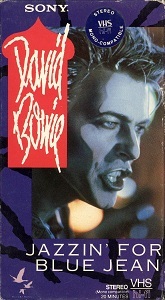 Following the commercial success of Bowie's previous album, Let's Dance, its singles and the Serious Moonlight Tour, "Blue Jean" was launched with a 21-minute short film, Jazzin' for Blue Jean, directed by Julien Temple. The song performance segment from this was also used as a more conventional music video. The film won the 1985 Grammy Award for "Best Video, Short form", later renamed "Best Music Video", which proved to be the only competitive Grammy Award Bowie won during his lifetime for over three decades, although Bowie posthumously won four Grammies for his album Blackstar (2016). "Blue Jean" would remain in Bowie's live repertoire for the rest of his career, being performed on his Glass Spider Tour (1987), Sound+Vision Tour (1990) and A Reality Tour (2004). Interviewed in 1987 and asked to compare a track like "Time Will Crawl" to "Blue Jean," Bowie said "'Blue Jean' is a piece of sexist rock 'n roll. [laughs] It's about picking up birds. It's not very cerebral, that piece." BBC reviewer Chris Jones criticised the song in his appraisal of Best of Bowie in 2002, arguing "'Blue Jean' barely exists, so formulaic is it." "Blue Jean" (Extended Dance Mix) remixed by John "Jellybean" Benitez at Sigma Sound - NYC - Engineer: Jay Mark. 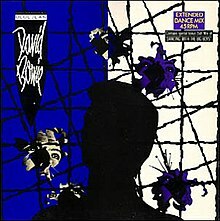 "Dancing with the Big Boys" remixes produced by Arthur Baker. The 3-minute version of the performance of the title track, edited from the full Jazzin' for Blue Jean video. The video is available to download for the Xbox 360 karaoke game Lips. An alternate version recorded for MTV in England that has no relation to the other videos. This alternate version was not popularly available until the DVD release of Best of Bowie in 2002. ^ Inskeep, Thomas (12 July 2005). "On Second Thought: David Bowie - Tonight". Stylus Magazine. Retrieved 25 June 2015. ^ Jones, Chris. "David Bowie Best Of Review". BBC. Retrieved 16 August 2016. ^ "Charts.nz – David Bowie – Blue Jean". Top 40 Singles. Retrieved 25 February 2017. ^ "BLUE JEAN – David Bowie" (in Polish). LP3. Retrieved 29 January 2017. ^ "LOS 40 PRINCIPALES Y M80 RADIO OFRECEN HOY UNA PROGRAMACIÓN ESPECIAL EN HOMENAJE A DAVID BOWIE". Los 40 Principales (in Spanish). Retrieved 17 March 2018. ^ "Gold/Platinum - Music Canada". Music Canada. Retrieved 16 February 2018. This page was last edited on 20 April 2019, at 10:07 (UTC).